TomTom Runner Reviewed - To Buy or Not in Apr 2019? While major companies take the credit, it’s often a smaller organization that’s designing the most dynamic features of their products. Such is the case with the Nike SportWatch, which was actually designed by TomTom. While Nike got the credit for that innovative fitness tracker, it was actually TomTom that put the time, design, and innovation in that sports watch. The company, which had first made its mark building GPS devices for cars, has now entered the fitness tracker market, creating the TomTom Runner. This GPS sports watch designed for runners seeking to track their performance either on the road or in the gym. With its easy-to-read display, the TomTom Runner is a fitness tracker that provides accurate real-time information for the runner to monitor their performance. Focusing solely on running (a Multisport watch is also available), the TomTom Runner provides the user with two options of activities to monitor: Run and Treadmill. With a built-in accelerometer and sensors that work both on an open run or on a treadmill, the TomTom Runner provides real-time data on distance, pace, stride length, lap time, and calories burned. A Bluetooth Smart support can also sync this fitness tracker with other devices, such as a heart rate strap. This activity monitor is a stand-alone product that frees the runner from having to carry their smartphone with them to sync the data being collected by the Runner. With an intuitive menu and easy to understand stat feedback, the runner can easily monitor, track, and compare their running times, routes, and performance without the hassle of navigating a complex interface. This affordable fitness tracker, with its sleek, lightweight design and accurate data collection, is a great starter fitness tracker for runners who want a straightforward sports watch that gives them the performance data they’re looking for in one activity: running. The TomTom Runner certainly says what it’s for: running. With just two options available to track - Run or Treadmill - this is certainly an easy-to-use and understand fitness tracker. Once the TomTom Runner acquires a GPS signal, the activities available for the runner include Goals, which tracks and compares time, distance, and calories burned; Laps, which tracks and compares preset times and distances, or manually inputted goals; Zones, which tracks pace and heart rate; and Race, which features predetermined times and distances the tracker then compares your performance against. During a run, total time and distance of the run are displayed at the top of the screen. Using the external analog buttons, the runner can scroll through various dataset options - including duration, distance, pace, calories, stride length, time of day, and even heart rate - that the TomTom Runner calculates using the accelerometer in conjunction with the GPS. Visual feedback within these training modes provides the runner with feedback on their current status within their present goals, while the Runner also keeps track of and notifies the runner with audio and vibrating alerts when a milestone occurs (or if the runner falls behind in pace). Keeping it simple seems to be the ethos of the TomTom Runner. While a more versatile model is available in the TomTom Multisport, the Runner is strictly for running. With just two options - Run and Treadmill - within these menus, the following options are available for tracking and data collection: Clock, Duration, Distance, Pace, Average Pace, Calories, Heart Rate (for use with the separately available heart rate strap), and Laps. The TomTom Runner records and keeps the data of the past five runs, and these datasets can be downloaded onto your computer or smartphone and used in conjunction with the TomTom Sports mobile app to build a more complex performance profile. The TomTom Runner is not a particularly advanced fitness tracker, instead, it is limited to basic running performance tracking. However, the watch stores the runner’s past five runs and after connecting the Runner to the computer, all previously stored runs are available, including maps, total distance, and average pace. Also, because the watch was made by a GPS company, it has an impressive built-in QuickGPSFix Technology, which is helpful for those who tend to get lost often. In addition, the TomTom Runner is waterproof up to 165 feet. Drift is a major problem with many fitness trackers: it seems that the built-in sensors that track distance tend to either slow down or speed up based on calculating the runner’s arm movement rather than calculate actual distance. While the GPS tracker on the TomTom Runner eliminates this problem on an open run, there is a noticeable drift when using it on a treadmill, with one reviewer calculating a the drift on an 11-mile treadmill run between the actual distance as recorded on the treadmill versus the TomTom Runner’s calculation, with the error adding a ⅓ of a mile on the TomTom. This may lead to having to recalibrate the TomTom significantly before receiving accurate recordings on a treadmill. But on the streets and track, its GPS capabilities help retain accurate recordings of distance and speed. The TomTom Runner is Bluetooth Smart enabled so data can be transferred wirelessly to your smartphone and synced to the TomTom Sports mobile app for more complex renderings and calculations of your overall runs over a length of time. The TomTom can also be connected to your computer via USB to download the stored data sets for compilation and comparison. There’s one major app related to the TomTom Runner, and that’s the TomTom Sports mobile app, which provides a larger overview of the compiled data your TomTom Runner uploads to it. This provides the runner with performance analysis, personal insights, 24/7 activity tracking, activity summary, social sharing, and more. While the TomTom Runner is a somewhat basic fitness tracker on its own, when combined with the Sports mobile app, it becomes a powerful tool for performance analysis and goal setting. With the main component being just slightly larger than a regular watch, the TomTom Runner is one of the less obtrusive fitness trackers on the market. Its band is made of perforated rubber that’s both slim and light, while the main component is housed in a raised support unit, which allows for the user to change out the color and style of the band while also allowing for easy access to the main unit. Since the Runner itself doesn’t sit directly on the skin, this makes it easy to slip off without discomfort. Weighing in at 1.75 ounces/50 grams, it’s a very lightweight fitness tracker. The TomTom Runner’s minimalist aesthetic allows for it to both look and function like an everyday watch, and runners will enjoy how this stripped-down approach to its design makes for a no-fuss wearing experience. While the main unit comes in only one color (black), there are a number of different colored bands available for those who demand color coordination. 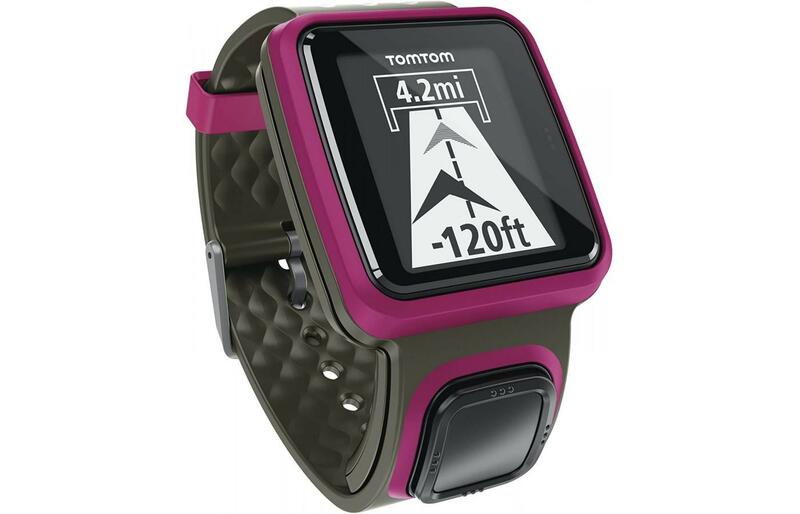 Like the tracker itself, the style of the TomTom Runner is straightforward and no-nonsense. While built solely for running in mind, this fitness tracker is waterproof up to 165 feet/50 meters, which means whether you forget to take it off before a swim or find yourself in a downpour, it will continue to function without missing a beat. Its scratch-resistant face and long battery life ensure that the TomTom Runner will keep working even after a nasty spill or if the runner forgets to turn it off after use. The face of the TomTom Runner is a scratch-resistant 1.5-inch monochrome LCD display. The system of navigation is interesting, as instead of a touchscreen or analog buttons, the user navigates the system using a D-pad that’s attached to the main unit and has a separate access opening on the band. However, tapping the right-hand of the screen turns on the backlight. Its easy-to-read displays may be simple, but this is in line with the TomTom Runner’s “no frills, no nonsense” approach. The TomTom Runner’s band is made of lightweight rubber that’s slim and perforated for adjustability. These perforations may leave small indentations on the skin if worn for long enough. The default band colors are black and gray, although other colors are also available. 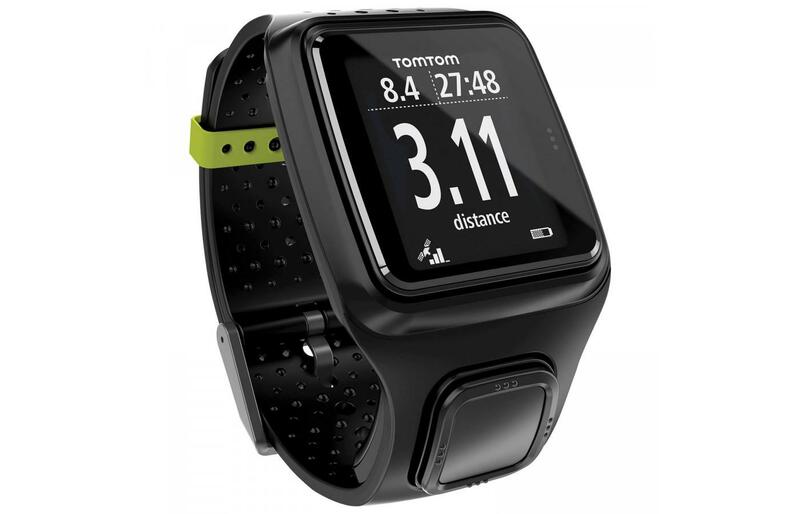 One great feature about the TomTom Runner is that it’s lightweight and just slightly bigger than a regular wristwatch. Another is that it’s slightly slimmer than many comparable fitness trackers, so even though the main unit is detachable from the band, it sits and fits closely on the wrist - although not too close, as the main unit is slightly raised off the skin. Its adjustable band makes this a one-size-fits-all fitness tracker. With a straightforward onscreen menu and intuitive controls and options, the TomTom Runner is a very easy-to-use fitness tracker. Since it is only made to record running data, and its options are limited, the runner can set their desired option and start running without having to navigate through a barrage of menus and options. Coming with a USB cable that’s used for both transferring data and charging, the TomTom Tracker’s charging capabilities are as modern and straightforward as its overall design and function: plug it into your computer or USB charging station and let it charge. With a battery charge that lasts for 10 hours of continuous use. The TomTom Runner has dropped in price since its initial release and now it’s one of the more affordable fitness trackers on the market. 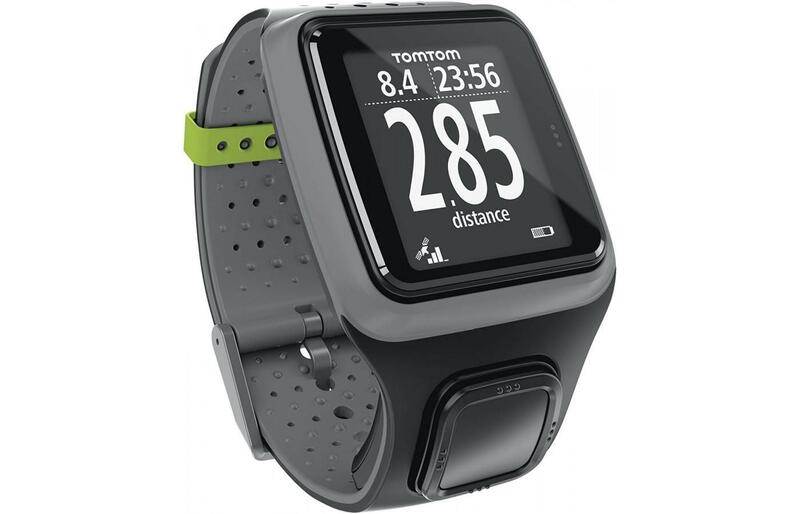 This may be due to its lack of versatility compared to other fitness trackers (and a Multisport version is also available at a slightly higher price), but for the runner who wants a straightforward sports watch that performs well and provides the data they’re looking for, the TomTom Runner is quite affordable and functional. A number of accessories are available for the TomTom Runner, including a charging dock, dual charging dock, car charger, heart rate monitor, and bands that are available in a variety of colors. For such a straightforward fitness tracker, it certainly does have a versatile array of accessories. For runners who may be hesitant to invest in more complex and expensive fitness trackers - especially ones that have features that they will never use - the TomTom Runner is a perfect fit. While it’s basic in function, it also has the functions that runners desire most in a fitness tracker - mainly accurate recordings of their pace, speed, distance, and time. When used in conjunction with the TomTom Sports mobile app, the runner is provided a more comprehensive and complex data compilation of their stats, which are useful when training or monitoring one’s progress. Although its calculation of distance on a treadmill tends to drift, when running outdoors or on a track its GPS and motion sensors provide highly accurate readouts. No fuss, no complex menus, and no extraneous features, the TomTom Runner is for one purpose only: running.